Join us to find out how a dynamic, intelligent firewall can improve your security, actively defend your enterprise and manage your resources in today’s threat landscape. 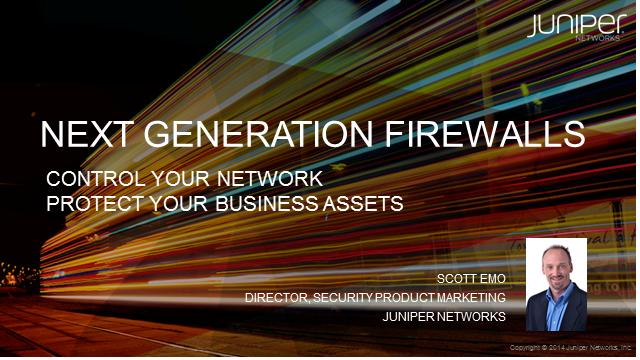 Join Scott Caudell, CTO of IDC 7ticks and Andrew Bach, Juniper’s Chief Architect for Financial Services to learn how automation within the network boosts competitive advantage. Join us to discover the high performance network infrastructure that is delivering competitive advantage to financial services organizations. To find out how a simple, automated network can facilitate the virtualization and security required to boost competitive advantage, be sure to join the webinar. Join experts from Juniper Networks and Rand Corporation for a fascinating overview of new research about the economics of the cyber crime market. In this research, key economic indicators show cybercrime is rapidly maturing, leading to a more diverse and challenging threat landscape for businesses, governments and people operating in the digital world. In fact, the ability to attack is outpacing the ability for many to defend themselves.